An APOLOGY about AXACON leads to a question: Did ALEC PETERS personally profit from AXANAR? Welcome back to another emotionally-charged episode of “As The AxaCon Turns”…the fan film controversy that asks the eternal question: Is Lane ever gonna stop blogging about this crap??? Well, I thought I was finished on Monday when I posted this blog about the detractors trying their darnedest to interfere with any chance of success for AxaCon by inundating the host convention, SphinxCon, and its chairman, DAVID WEINER, with all sorts of negative public and private comments about ALEC PETERS, AXANAR, and the invited guests (including yours truly). Yeah, that happened. Then everything else happened. Then I blogged about it. 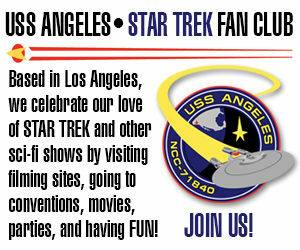 That lit up the fan film quadrant of the Internet for many hours on Monday while I took my son to see the King Tut exhibit at the California Science Center. There were literally hundreds of comments waiting for me to read when I got home! But one message stopped me in my tracks. 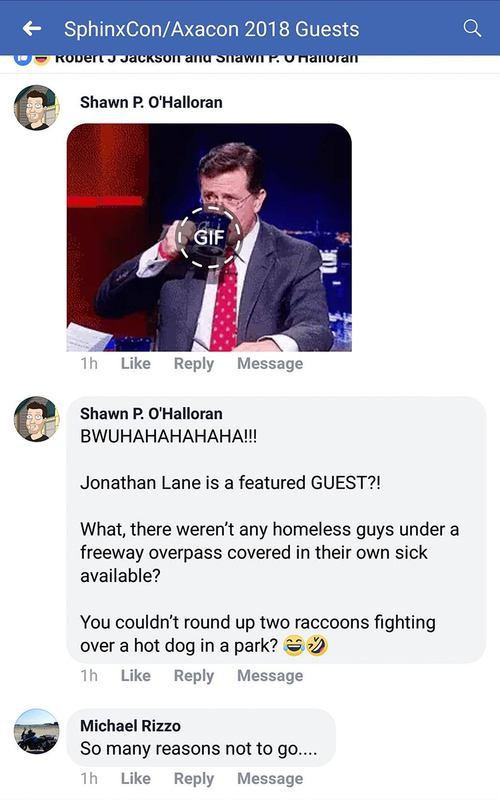 It was an APOLOGY from Shawn O’Halloran to Dave Weiner for disrupting his convention page! 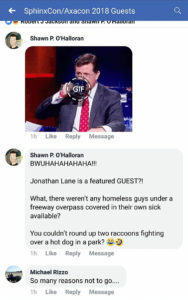 Author Jonathan LanePosted on June 26, 2018 Categories Editorials, NewsTags Alec Peters, AxaCon, Axanar, Dave Weiner, Jonathan Lane, SphinxCon61 Comments on An APOLOGY about AXACON leads to a question: Did ALEC PETERS personally profit from AXANAR? Perhaps “torpedo” isn’t the right word. Sabotage? Interfere with? Mess up? Mock? Belittle? Bash? Brutalize? Bully? Eliminate? 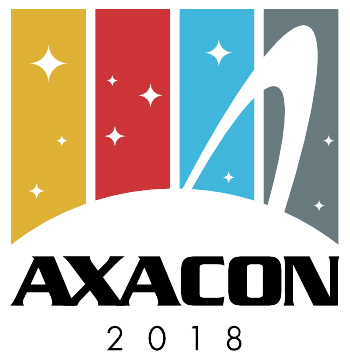 Whatever you call it, at least a couple of dozen AXANAR detractors (possibly more) seem to be making a concerted effort to convince the organizers of SphinxCon in Atlanta not to host the first AxaCon as a “con-in-a-con” on November 2-4. Earlier this year, detractors had made similar efforts to pressure Eric L. Watts of Treklanta to disinvite ALEC PETERS as a guest…so much so that Eric asked to write a guest blog addressing their behavior. The same day I was conducting my interview with ALEC PETERS about AxaCon and how it came to be an “add-on” to SphinxCon, the detractors were descending on the SphinxCon Facebook page with a wave of attempts to throw a monkey wrench into the works. Last time it was Eric Watts. This time they needed to get their message out to DAVE WEINER, the organizer and chairman of SphinxCon 2018. Dave lives in Decatur, GA with his wife Joanna and what he refers to as the “two house cats of the apocalypse.” He has been active in The Royal Manticoran Navy: The Official Honor Harrington Fan Association since 2014. He is responsible for TRMN’s online infrastructure and branding. TRMN has held two conventions a year for the past 5 years–one in Raleigh, NC called HonorCon and one in Minneapolis, MN called MantiCon. 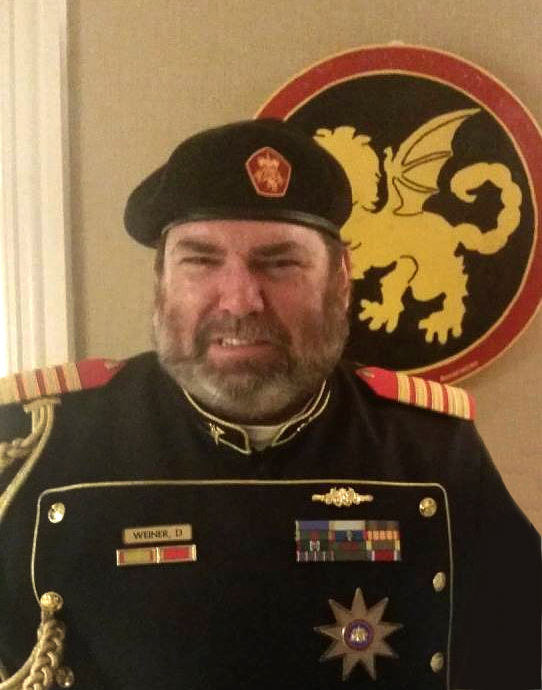 SphinxCon will be their first in Atlanta, although Dave and many of the directors and deputies have experience running and working on other cons (including Dragon*Con). Dave wanted to share what’s been going on since this past Friday because it has been very disturbing to him as a fan and as a convention organizer. Having now observed the detractors firsthand and their attempts to try to put a positive “spin” on their actions, Dave would like set the record straight on exactly what has happened.